I’ve got 7 basic tips to break down time management. Time management and productivity is a highly requested topic. and go over how to manage your time most effectively so you can get important things done. (Not just more things done. More important things done. Prioritization is key. What is it that you actually need to do? You might have heard the sayings “work smarter, not harder” or “the early bird catches the worm” or “eat the frog.” All of these saying have to do with productivity. I want to break these sayings down into their take home messages. The saying “work harder, not smarter” really means understanding your priorities and scheduling your time accordingly. This is usually well received advice. In other words, do the most difficult, most draining task first. When you do this, it really helps you tackle the day and get through your to-do list. You want to do your most energy creative work first. Some people like working out first thing in the morning. I like doing my hardest thing – the thing that takes the most energy. For example, if you’re writing a book (which is great for passive income) you want to carve out time and do that first. Or say you’re really struggling with tech (because let’s face it: sometimes tech is tough for your business), you’ll want to do that first. For me, content creation takes a lot of energy, so it makes a lot more since for me to come up with ideas early in the morning. When I say content, I don’t just mean posts. I mean podcast ideas, captions, strategies, framework for my business, course creation, etc. Everything that has to do with my business and content, I’m going to get it done as early as possible. I’ve already alluded to this when I talked about the priority matrix. That’s when you take your task list and break it down and determine what is urgent, what is important, what has high importance, and what has low importance. You want to prioritize tasks that are both high urgency and highly important. For example, that might be movement in the morning. Next on that list will be tasks that are high priority and high urgency. This might be creating content. And as you move down in the matrix, you’ll find tasks that have low importance and high urgency. (For me, this is emails.) Next, you’ll have low importance and low urgency. These are the tasks that you aren’t going to do. That’s where a lot of us get caught up and think we have to do everything. This could be anything from chores, creating graphic design, outsourcing something in your business, etc. 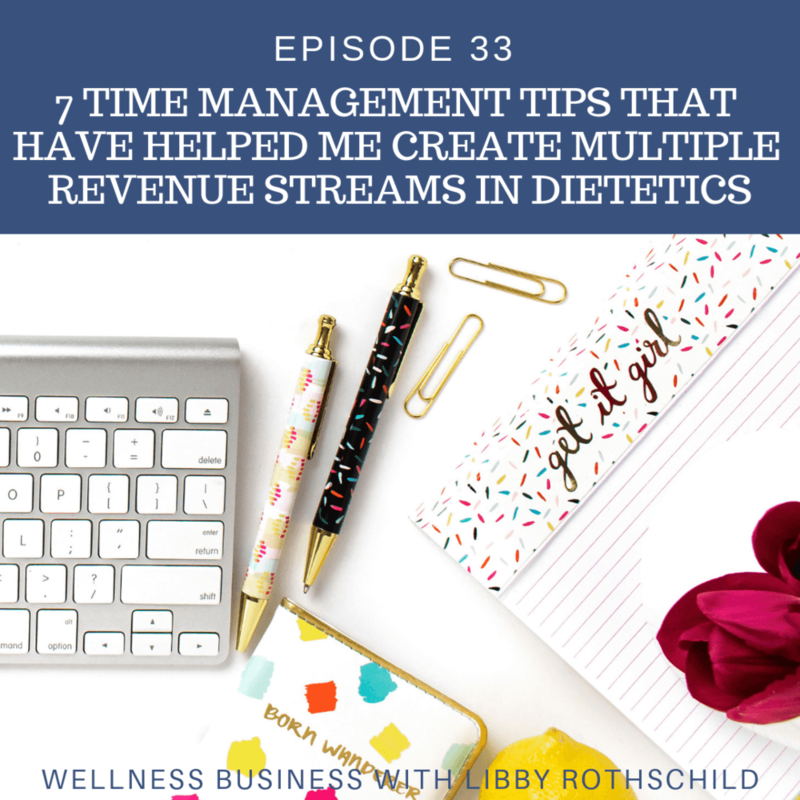 If you can conceptualize your day, week, or quarter, that’s really going to help you manage your time, streamline your business, and create revenue. Ask yourself: What do I need to do right now? This depends on your day and your week. For example, it could be recording a podcast. I’m airing this on Monday and today is Sunday. I’m doing this because you told me you wanted this and I want to give my audience what they want. Because of this, me recording this podcast would move up on the priority matrix. Of course I have planned content, but I want to answer your questions. If you tell me you want something, it’s up to me as a business owner to deliver that. You have to know what your goals are. Are they part of your business? Creating revenue? How much? Creating systems? What systems do you need to create? Where do you need help? Do you have an email list? Have you created sequences for your email list? What’s your goal with your email list? You need to hash out all of those things and think them through ahead of time. I’m huge on quarter goals and I like to think of things in quarters. Q1-Q4. This breaks up the year into three month chunks. This will help you break down your goals and look at the big picture. What’s the big goal for the year? Identify how you can quantify that goal and then create SMART goals for yourself. Once you do that, most of your actions should be related to those SMART goals. This will help you stay on track. Think critically about your business. Is that what you’re doing? Are you thinking? Taking action? Evaluating? There’s a saying I really like: I will tell you what your goals are when you show me how you spend your time. I’m not sure where this quote comes from, but I love it because it’s so true. When my clients are struggling with time management, I ask them to keep track. I do the same thing with my business coach – she got me on Timelines, an app to help you track how you’re spending your time. Alternatively, you can track your time with pen and paper or on a spreadsheet. Just make sure that you create a system that works with your personality so you can determine if how you’re spending your time aligns with your goals. This is where the Priority Matrix comes into play. What’s urgent and important? What’s not urgent and not important? I recommend doing this for every day of the week. You want to look at your week and decide when you’re the most busy, when you typically have the most energy, etc. Most of us will end up doing better at the beginning of the week and in the beginning of the day. In other words, most people have the most energy and can create the most output earlier in the day and Sunday through Tuesday. Research actually shows that Tuesday is the most productive day of the week. There are some exceptions. Some people are more productive in the evening and during the second half of the week, but that’s not true for the majority of us. I want you to think hard about when you’re the most productive and then I want you to fill out the priority matrix. Think a week ahead. What is it that you need to do? What’s urgent? What can be pushed back until later so you can get one step closer to your goals? When you do this for every day of the week, it’ll train your brain to let go of some of the tasks that take up too much of your time. For example, I’ve heard from my clients that email management is extremely time consuming. It’s true! Try to check your email during designated times during the day or create a system that can help save you energy and time in your business. A lot of us prioritize email and we don’t realize that we’re putting it into the urgent section in the matrix even though it shouldn’t be there. You won’t know that until you fill out the matrix and figure out how much time you’re spending on different tasks. Planning ahead is a huge component of time management and it’s something that I’m the best at. When I say content, I’m referring to things like Instagram and podcasts. For example, I have all of my podcasts planned out for the rest of the quarter and my instagram posts are planned out into next quarter. That being said, I do leave wiggle room. Today I had another podcast planned but because you told me this week that you really want an episode about productivity, I decided to give you what you want. It’s in my best interest as a business owner to deliver what you want, when you want it. And because I get so many direct messages and questions from my listeners about things like increasing income, dietetics, social media, business focus, passive income, etc, I make sure to create room for additional content that’s based on your questions and feedback. Yes that messes with my schedule, but I still have that outline to work on. This decreases stress and gives me a pretty good sense of the direction of my business. In other words, I create the content, create a loose framework and adjust based on what my audience wants. This helps me grow my business and solve my audience’s problems. Putting your phone on do not disturb is a great way to get more important things done. Imagine that it’s Monday morning, the most productive time of the week for you. You block off time that you want to spend creating content, but you got a text, an email, and a phone call. Instead of creating content, you get distracted. You have to find a way to minimize distractions because they can creep up on you! I’m a huge fan of putting my phone on do not disturb in the morning for a few hours so I can focus. This can be a one hour chunk, two hour chunk, three hour chunk, etc. Just be sure to focus on what you put on your Priority Matrix so you can get things done in your business. Another tip is to block off certain times in your calendar. I like to color coordinate my calendar so I can set up different times to create content, sleep, commuting, meetings, etc. It’s essential that I have focus during those blocks of time. If I’m not focused, then I’ll take double the amount of time on that one given task. Blocking off time, eliminating distractions, and focusing will make you some much more efficient. When you allow yourself to focus, it’s incredible what you can get done. This is my favorite topic. I love delegation. So many of you are afraid that it’s too expensive or that someone else won’t do it right. But once you get to a certain point in your business, you have to delegate. If you’re at the point where you’re turning a six-figure business to a seven-figure business, not delegating is not an option. And if you’re still getting to that point, you still have to delegate. This means finding someone to do that task you didn’t want to do – the one that’s not urgent and not important. That could be logo design, graphic design, photography, editing, podcast publishing, etc. I also try to find ways to save time. For example, I hire a house cleaner. That’s not directly related to my business, but having a house cleaner come to the house frees up time for me to focus on my business. This allows me to manage multiple revenue streams. You can do it too! You just have to have the mindset, priorities, and goals that align with your priorities. You might be wondering why I’m talking about spending and prioritization at the same time. Believe it or not, when you do a line item of your budget, it’ll help you with your grow your business, save money, and save time. Separate personal and business expenses and set limits for your budget. Use mint.com, pen and paper, create a spreadsheet, or any of the other tools out there. Create a budget and review it on a weekly or monthly budget. Go over everything. It’ll help you understand your priorities. If you don’t think you can afford to hire a graphic designer, take a look at your budget and see what you can adjust so you can reevaluate how you spend your money. It’s really important to get a grip on that and understand your budget. I take my budget very seriously and save a significant amount to spend on personal development. Books, courses, coaches, conferences, masterminds, etc. I invest a huge portion of my budget and my business’s profit in my business and professional development. This is because I have a strong growth mindset and growth mentality. I see my business flourishing and I want to put my time and money into it. That being said, I want to do this with a plan so I make sure I quantify, review, and reevaluate my budget. You’re probably wondering why I put this last since it’s so important. I think it can feel a little bit removed to mention self-care first, but the reality is that a lot of us who are in business tend to put ourselves last. Self-care doesn’t have to be massage. It can be meditating, getting your nails done, a phone call with a family or friend, spending time with a loved one, etc. I realize a lot of us struggle with this, but you want to try and build this into your day and week. As you’ve heard before: self-care isn’t selfish. If you’re investing in self-care, you’ll find that you’re being more kind with yourself and you’ll be more in touch with your business and needs. Zola on Episode 81 – How often do you re-evaluate your website in your nutrition business?